Holiday Advertising, Branding, Traffic Generation | ASTRALCOM - Content Strategy, Conversion Marketing and Customer Acquisition. 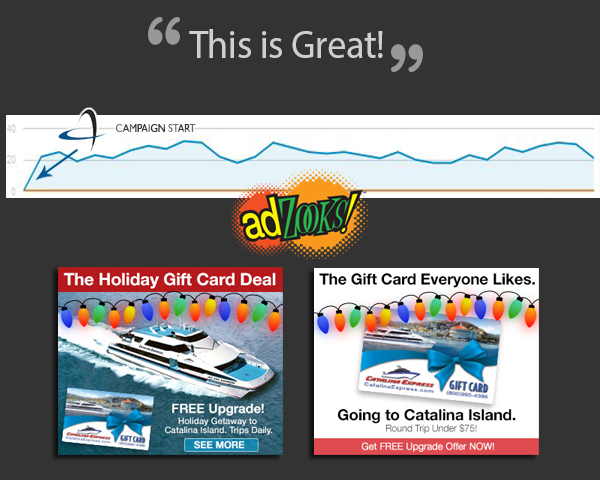 Catalina Express – Advertising, Branding, Traffic Generation | ASTRALCOM – Content Strategy, Conversion Marketing and Customer Acquisition. Advertising during the holiday season is always a tough job. Typically, response and ad click-thru rates are low. Connecting with consumers, of course, becomes more difficult. Making that all-important connection is easier, though, when the creatives and messaging are captivating and the subject matter is interesting. Catalina Express wanted to reach new local shoppers during the holiday season. The offer was straightforward – consider going to Catalina Island as a gift. The marketing key performance indicators (KPIs) point to unquestionable success. It doesn’t matter what city you’re in. It doesn’t matter if you need national, regional or local targeting. adZooks! delivers every time. Contact us for your syndicated banner advertising needs.